Can you believe it's nearly Christmas?! There are a few people left to shop for on my list, the hardest to shop for, of course. Every year I find myself asking, "what do you get the person who has it all?" Gift cards are too impersonal, they've already got all of the latest gadgets, and nothing seems to fit the bill. I find myself aimlessly wandering department store and specialty store aisles, always leaving empty handed. After searching endlessly, I finally found the perfect gift and it's customizable, reusable, and luxurious to boot. Mugler fragrances creates refillable fragrance bottles for some of their most coveted fragrances, like their best selling ANGEL. This fragrance is warm and spicy, with notes of caramel, chocolate, honey, and vanilla, creating a seductive blend for the modern woman. And when you purchase directly from muglerusa.com, you can receive complimentary engraving on select fragrance bottles giving your gift that extra-special touch with the recipients name right on the bottle. It's not just ANGEL that can be engraved and customized either, many of Mugler's fragrances for both men and women can be personalized with engraving and ready for holiday gifting in no time. 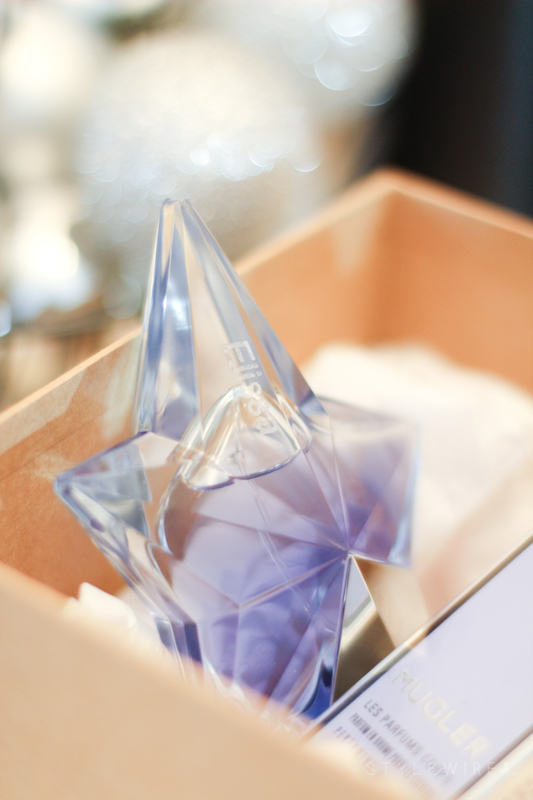 Included with this gift was Mugler ANGEL's new perfuming hair mist, a must-have around the holidays. It's created with a special technology that dispels all of those holiday party odors like cigarette smoke, food smells, obnoxious candles, and the like, and uses a patented intense diffusion system that activates the scent every time you move or flip your hair-- how cool is that!? But you could also pair it with one of their handcrafted candles or rich perfuming body creams. All that's left is to wrap and place it under the tree till it's time to present to the lucky gift giver! This post was sponsored by Mugler ANGEL. All content and opinions expressed are my own. Thanks for supporting those who support Style-Wire.com!